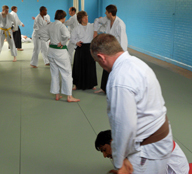 Aikido in Reading. Martial Arts in Reading and Caversham, Berkshire. Choose Caversham or West Reading. Start your martial arts training whenever you want! 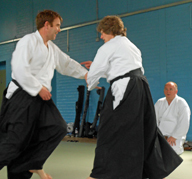 Aikido Foundations Course only £60 (£50 unwaged). If you're sure Aikido is the right martial art for you register and pay online today. Train once, twice or three times a week. Start something new! Just come along, try a free Aikido session and discover what it's all about. Welcome to Aikido in Reading, Berkshire, at the White Oak Dojo. We've been offering training in Japanese martial arts in Reading and the surrounding area since 1991. 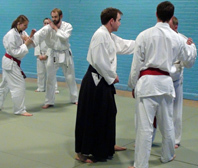 We run courses in the basics of Aikido to provide beginners (aged 18+) with a structured introduction to this exciting martial art at the YMCA in west Reading and at the Caversham Heights Methodist Church Hall in Caversham to the north of Reading. Just get in touch to give Aikido a go! We're a friendly martial arts club, where you're always welcome to come and watch one of our Aikido classes and talk to us before you start training. What's more, your first training session is free, so you can have a go and see if you'll enjoy Aikido, whether it's the martial art for you and whether you like the classes before committing to anything. Martial arts training at White Oak Aikido is open to anyone over the age of 18 and we have no upper age limit. Find out more about starting your martial arts training in Reading. Our team of highly skilled and qualified male and female instructors have some 90 years' experience of training in and teaching Aikido. That means you can be sure that your martial arts training will be of the highest calibre. Please read on to discover more about what is Aikido, the benefits of Aikido and our Aikido lineage and affiliation. Aikido is a fascinating and engrossing, traditional Japanese martial art, a way of self-defence, that makes use of an attacker's strength, momentum and aggression. 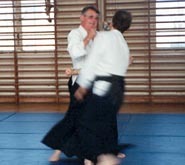 Historically, the techniques of Aikido originate from the throws, joint locks, sword and staff techniques of the samurai warrior. Aikido training will also help you to optimise how you move your body to maximise your efficiency and power, developing a deep understanding of how your body works and how this power can be used most effectively. Aikido is a martial art that doesn't rely on you being stronger, fitter or faster than an attacker, so it can become a lifelong study. Obviously, of course, younger people will tend to be more active and train harder and more physically, whilst older people will tend to train more slowly - either way, our aim will be to challenge you and push your boundaries. You'll find that Aikido is a very flexible martial art, where you learn to use a level of response appropriate to the situation. Emphasis in your Aikido training is placed on evading, absorbing and redirecting an attack, rather than trying to block an attack by a potentially stronger person. Aikido classes will teach you the importance of achieving mental calm and control of your own body in order to deal with an opponent's attack effectively and, whenever possible, without causing unnecessary harm. At one extreme, a form of Aikido is used by the Tokyo riot police, but unlike some other martial arts, the ultimate aim of modern Aikido is to control, rather than to maim or kill an opponent. Check out our tips on finding the best martial art for you. Aikido is a dynamic, expansive martial art, in which you'll develop fitness, suppleness, good posture and co-ordination. Your self-confidence will also increase as you train in Aikido and, as your co-ordination and balance improve, you'll work on being more present in your body and on occupying your personal space. Aikido training helps you to identify your personal boundaries and gives you the skills to defend them. As you train in Aikido and gain confidence in your skills, you'll be able to move away from adrenaline fuelled 'flight or fight' reactions and instead choose to respond in the manner most appropriate to the situation. The same Aikido approach can be extended to non-physical conflict resolution. Modern living tends to make us wary of physical contact. Aikido training will help you to work in close contact with another person in scenarios where physical contact is at its most threatening. Aikido classes offer you the opportunity to express yourself freely through movement. The absence of physical and mental tension and resistance, which we emphasise in our Aikido classes, can help you to release any ingrained constraints in your body and your movement, that could give rise to frustrations, energy blockages and illnesses. Aikido can help you to face any fear of confrontation you may have and to learn a new way of resolving conflict. Training in Aikido will develop your physical relaxation, mental calmness and awareness, so you can respond freely to what occurs. Regular training in Aikido helps you to become centred and grounded and, therefore, better able to deal with the stresses of daily life. White Oak Aikido in Reading was founded in 1991, based at the YMCA, Parkside Road, Reading Berkshire, and carries on an Aikido tradition in Reading which was first established in 1969 at Reading University, under the auspices of Haydn Foster Sensei (7th Dan), one of the great pioneers of Aikido in the UK in the 1950s. Our senior instructor was a direct student of Haydn Foster Sensei for some 27 years and all our instructors are recognised as coaches by the British Aikido Board, the national governing body for Aikido in the UK. We teach a traditional style of Aikido incorporating empty-handed techniques, the bokken and the jo - take a look at our vision here. Nine videos of Saito Sensei's seminar in Cambridge in 1989 are now available from Vimeo on Demand. You can watch the Iwama Aikido Video trailer on Facebook. Or head over to our Vimeo page for Saito Sensei Videos to access all six hours of this in-depth teaching. Or please Contact us if you have any questions about Aikido classes in Reading. 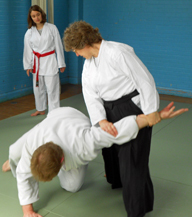 Martial arts training at our Aikido dojos in west Reading and Caversham. Beginners are always welcome to come along and watch a training session or to join in for a free taster session - come and give Aikido a go! Easily accessible from Emmer Green, Burghfield, Calcot, Coley, Katesgrove, Southcote, Theale, Tilehurst, Fords Farm, Holy Brook, Norcot, Newtown, Lower Earley, Kennet Island, Green Park Village, Whitley Wood, Woodley, Pangbourne, Purley on Thames and Thatcham. O Sensei – the founder of Aikido (1883-1969).